For many, the main objective of search engine optimisation is to achieve good natural positions in order to reduce the reliance on expensive sponsored links to generate traffic and sales. 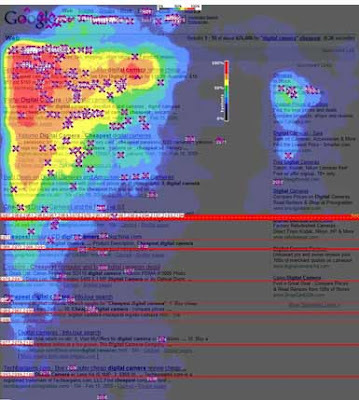 Search evangelists will be familiar with the golden triangle effect, an eyetracking study demonstrating where users tend to look and click on a generic search engine results page (SERP). Many organisations believe that by obtaining a top 3 position in the organic listings, their expensive paid listing can be removed. There are two main reasons why I believe this is an outdated strategy. Google make their lion share of their profit from paid links. Therefore, it is in Google's interests to ensure that they achieve annual revenue growth from sponsored links and match shareholder expectations. The first paid listings showed purely on the right hand side of the page, known as the right hand rail. Now, Google shows between 1-4 sponsored links above the traditional organic listings coupled with occasional onebox results just below, thus removing the potential for an organic ranking above the fold. With reference to the Golden Triangle, users are increasingly likely to click on a paid listing providing it is relevant to their search query. In essence, Google is in control of the ratio of organic to paid listings on the page and this can be changed at any point. If paid search revenues begin to plateau increasing the number of paid listings within the SERP is just one method Google have of increasing search revenue. The second reason is one that is often overlooked by many search marketing experts. The main search networks syndicate their results out to other networks, powering their search function. The diagram below demonstrates how this is the case. Essentially, the results will be displayed in the same order but not necessarily in the same format. For example, the following screenshot is from a search for "loans" on Google. There are three sponsored links within the shaded area. These are the organisations that have set high max cpc's. More sponsored links are located on the right hand rail with the remainder of the page above the fold being populated by 7 natural links. There is no right hand rail on the AOL SERPs. In this example, six paid listings are shown at the top of the page, followed by four natural listings above the fold at the bottom. Taking the eyetracking study into consideration, it can be argued that a user is more likely to click on a paid listing when using AOL than with Google. This causes complications for search marketers looking to make informed decisions on both paid and organic search. For example, the paid listing in position seven on Google does not show on the first page of AOL. Therefore, a search marketer looking to reduce bids and move from position six to position seven will lose more traffic potential than could potentially be forecast. Additionally, optimising natural positions to achieve a 3-7 position will yield benefits in an above the fold placement on Google, but achieving positions 5-7 will be below the fold on AOL. For some of the sites I work on, AOL is the third biggest search engine, sending more traffic than MSN Live. Other engines in the UK that drive traffic via syndicated Google results include the major ISP's Sky.com, Orange.co.uk and Virgin which shows a staggering twelve sponsored links before the organic listings. Even a number one position in the organic rankings on this engine, is not good enough to achieve a placement above the fold. Those looking to reduce their reliance on paid search must consider the fact that a percentage of searches do not come from the primary search engines. It was recently stated that more searches are carried out on Yahoo's partner sites than on the actual Yahoo! network. They will also face will strong resistance from organisations that are making the most money from it. In short, paid search will not go away. However there will be a crunch point when advertisers cannot make their landing pages or advert creative any more relevant and they cannot afford to invest any more. The search engines are aware of this, hence the continual diversification into other online areas.